NEW YORK, March 12, 2018 /PRNewswire/ -- Acura will hold the world debut of the all-new 2019 Acura RDX and RDX A-Spec, in production form, at the 2018 New York International Auto Show (NYIAS) and via live-stream on March 28 at 12:15 p.m. ET. The third-generation RDX, launching mid-2018, is the first in a new generation of Acura products featuring the brand's new design language, Precision Cockpit inspired premium cabin and groundbreaking True Touchpad Interface™. The reveal will feature the 2019 Acura RDX along with the new RDX A-Spec, the first application of the sport appearance variant to an Acura SUV. 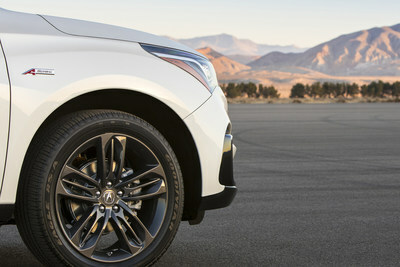 This third-generation Acura RDX marks the return of Super-Handling All-Wheel Drive™ (SH-AWD®) to the RDX lineup, and pairs it with a powerful new 2.0L VTEC® Turbo engine, segment-first 10-speed transmission and NSX-inspired Integrated Dynamics System, making it the quickest and best-handling RDX ever. The 2019 Acura RDX was designed and developed in America for the first time, styled by the Acura Design Studio in Los Angeles, California and developed by engineers in Raymond, Ohio. The new RDX will be produced at the company's East Liberty, Ohio plant, while its new VTEC Turbo engine will be manufactured in Anna, Ohio1. The Acura RDX has sold more than 50,000 units each year since 20152, maintaining its position in the premium-entry SUV segment as a perennial top-seller. Additional media information including pricing, features and high-resolution photography is available at AcuraNews.com. Consumer information is available at Acura.com. Follow Acura on social media at Acura.us/SocialChannels. 2 Based on Autodata sales for the Entry Premuim CUV segment for individual calendar years 2015-2017.